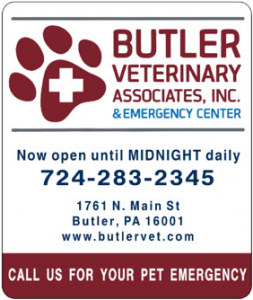 Butler Veterinary Associates is a full service small and large animal hospital, capable of handling most medical or surgical problems. In addition to routine wellness care, we offer hospitalization, diagnostic blood testing, EKGs, ultrasound, routine and specialized radiographic procedures, and the latest microchip pet identification. Our surgery suite is well staffed and equipped. The doctors and staff at BVA are dedicated to providing the best medical care possible for your pet. We provide a wide variety of diagnostic tools to help accurately diagnose each individual patient and provide appropriate care. Digital radiography by Agfa is used to take x-rays with the highest possible resolution and detail. These are far superior to film x-rays in the ability to see changes in both bone and soft tissue structures. They are also very easy to share with other veterinarians and veterinary radiologists if an expert opinion is needed on your pet’s x-rays. We also offer imaging by ultrasound in addition to radiography. Ultrasound is used to examine abdominal organs and diagnose tumors, pregnancy, and bladder stones, as well as cardiac (heart) imaging. Our hospital recommends pre-anesthetic bloodwork to assure the safety of your pet during surgery. Modern gas inhalation anesthesia (sevoflurane and isoflurane), along with both respiratory and cardiac monitoring equipment are used to ensure the safety of your pet. Our doctors and technicians make anesthesia as safe as possible by selecting the best combination of anesthetic drugs for each individual patient. We recommend IV catheters for all patients to allow fluids administration and rapid access for drugs should that be needed in the event of an anesthetic emergency. All vital signs, including blood pressure, are monitored closely during the entire surgical procedure by a qualified technician. In addition to spay and neuter surgeries, we offer many surgeries not commonly undertaken by some general veterinary practices. These include, but are not limited to, bladder stone removal, removal of objects form the GI tract, intestinal resection and anastamosis, splenectomy (removal of the spleen), nephrectomy (removal of a kidney), all types of hernia repair (umbilical, inguinal, perineal, diaphragmatic), tumor removals, ear surgery and eye surgery. We can repair many but not all broken bones through the use of internal fixation (bone pins and wires) and external fixation (cross pins clamped to an external bar). We also perform many joint stabilization surgeries such as cruciate repair by tightrope fixation. We also do other types of hip and stifle (knee) surgeries.